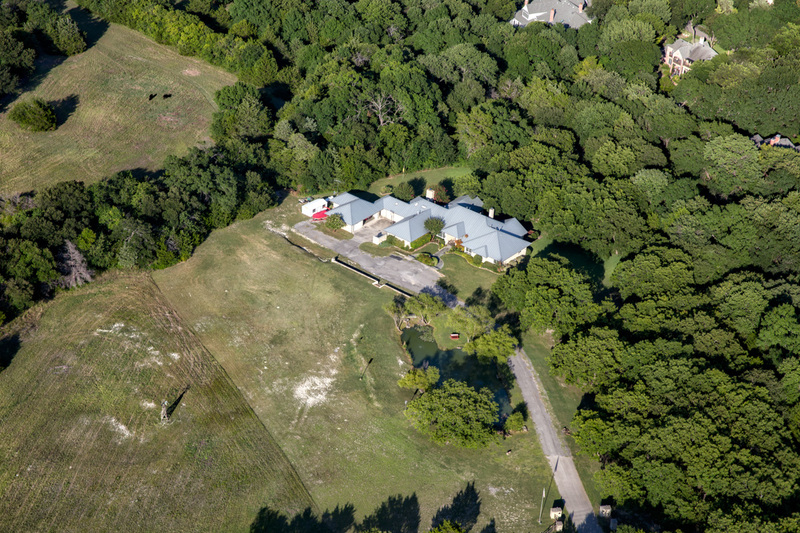 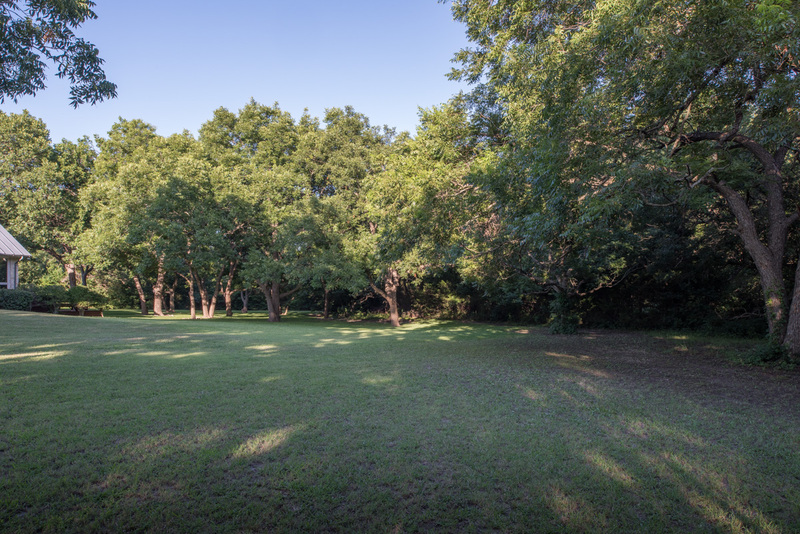 A beautiful Texas hill country home on a picturesque heavily wooded, creek-side 6+ acres in the quiet Collin County countryside. 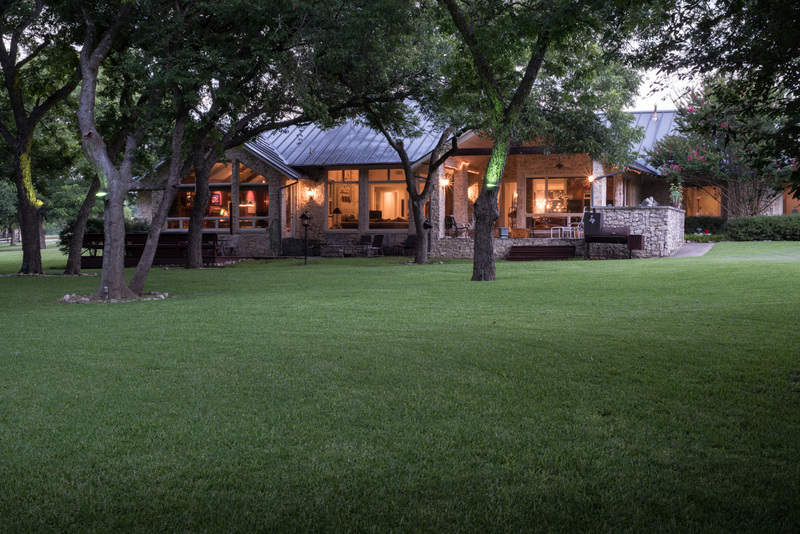 This special custom-built one-of-a-kind, single-story, stone, hill country estate is situated on scenic acreage down a quiet, secluded country road. 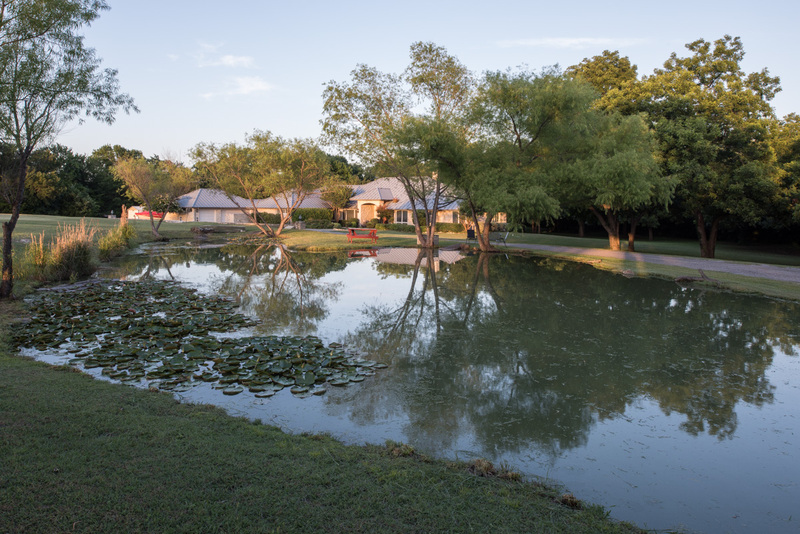 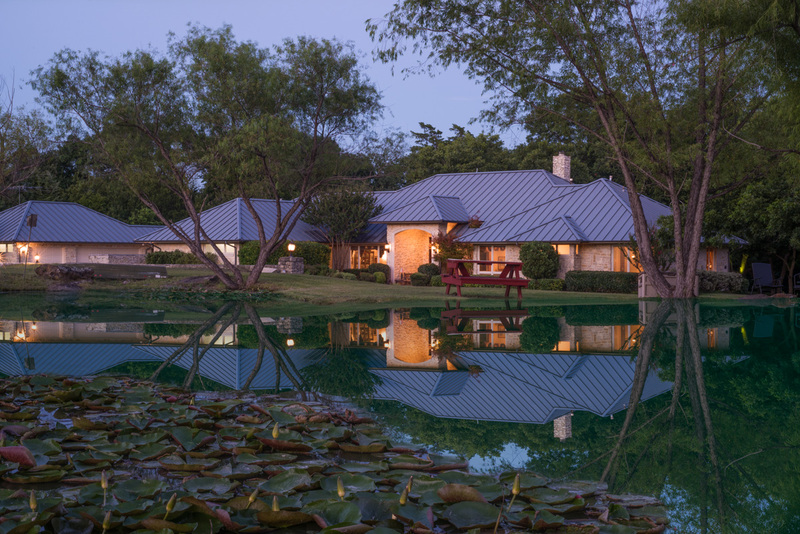 This unique property features a charming stocked pond with flowering plants and lily pads sheltered by willow trees, set along the winding driveway under a canopy of native trees. 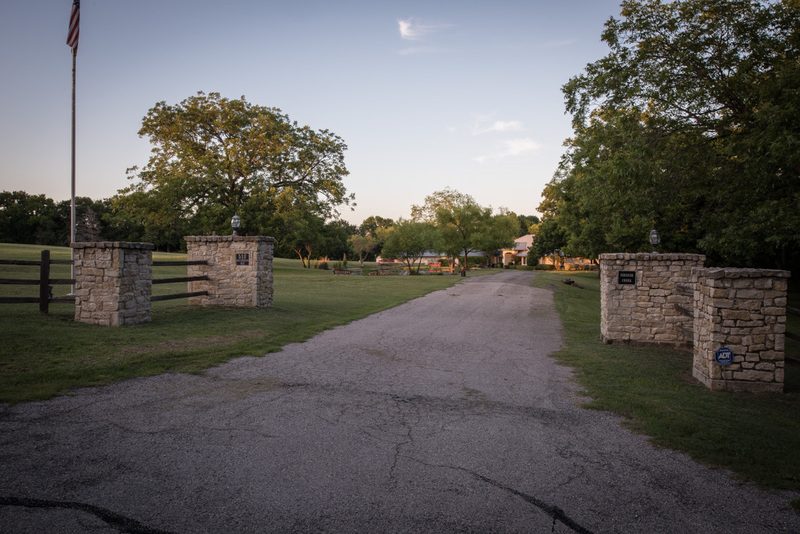 The driveway and motor court are outlined by stone steps that lead to the vast, rolling front property and pond, along with an additional set of stone steps that guide you to the front entrance past groomed flowerbeds. 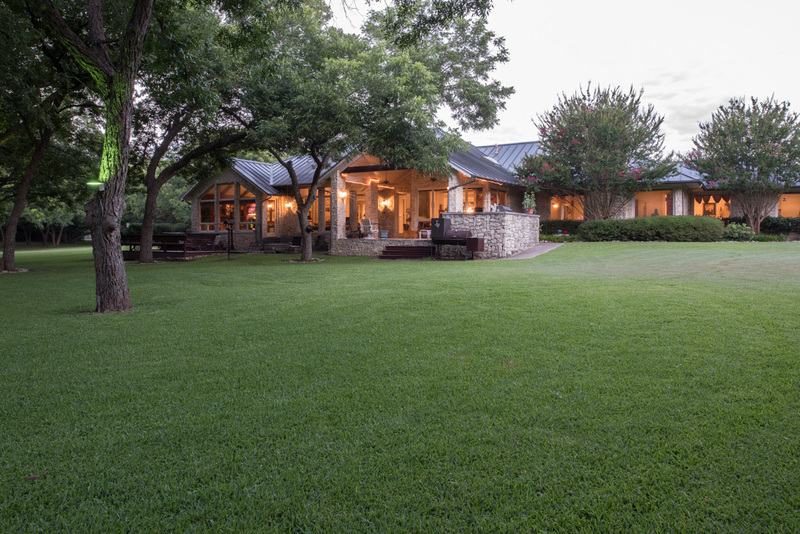 The welcoming Entry features a heavy solid wood front door encircled by transom windows flooding the space with natural light. 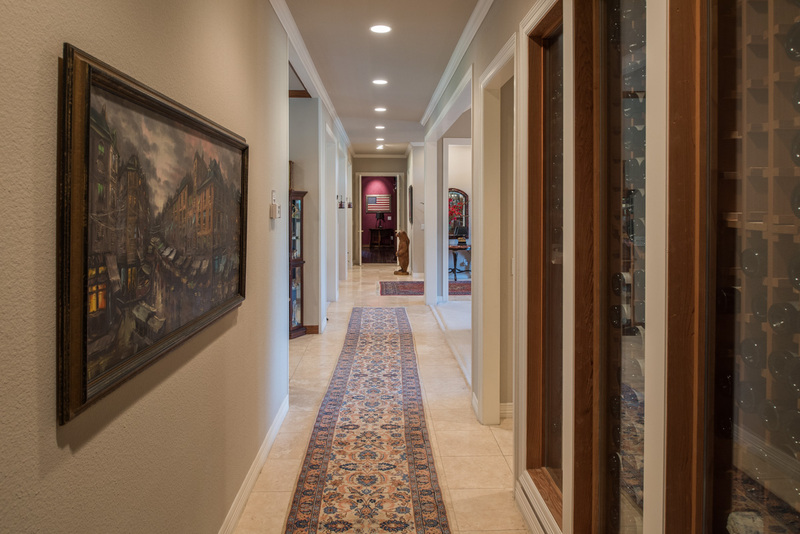 The Entry features travertine tile floor and connects to the Formal Dining Room, the Great Room and a Gallery extending to the Game Room and the Master Retreat. 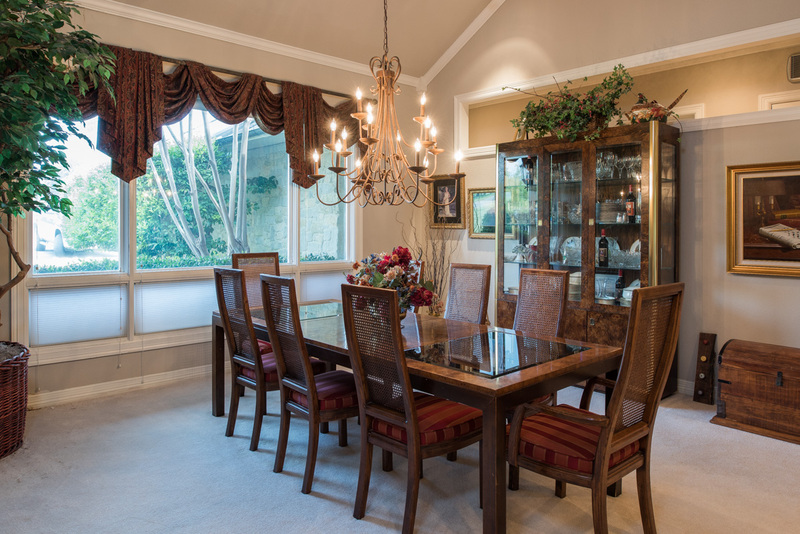 The stylish Formal Dining Room offers a beamed, vaulted ceiling with an elegant chandelier. 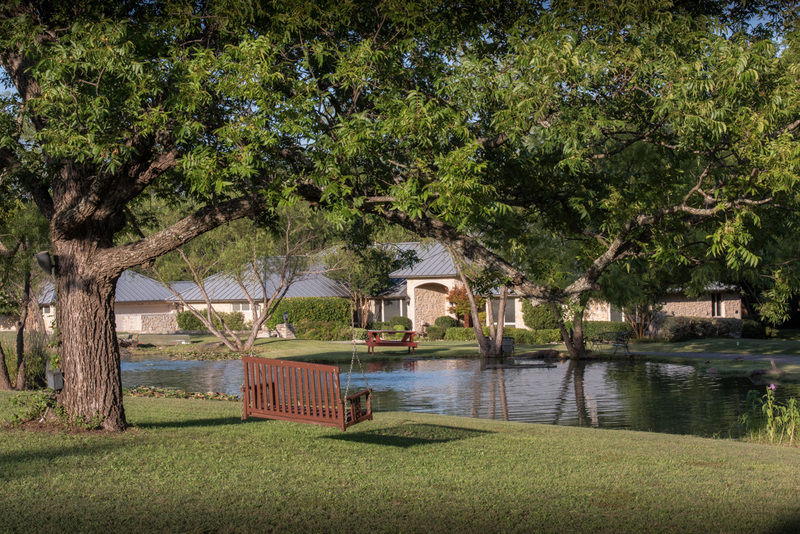 Several large double-paned windows provide beautiful views of the front property and pond. 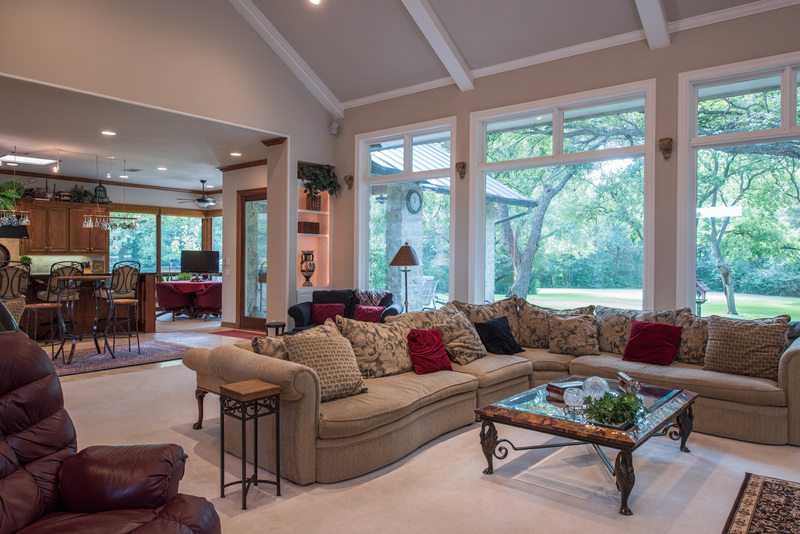 The open Great Room flows into the Kitchen and Breakfast Nook and offers an eye-catching 18 ft. high cathedral beamed ceiling. 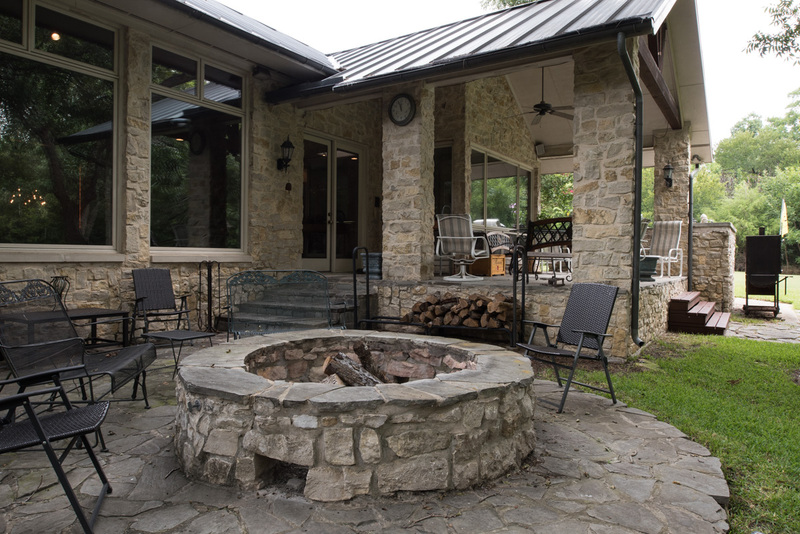 The rustic stone floor-to-ceiling fireplace is the focal point of the Great Room and is brightened by a wall of windows showcasing panoramic views of the rear property. 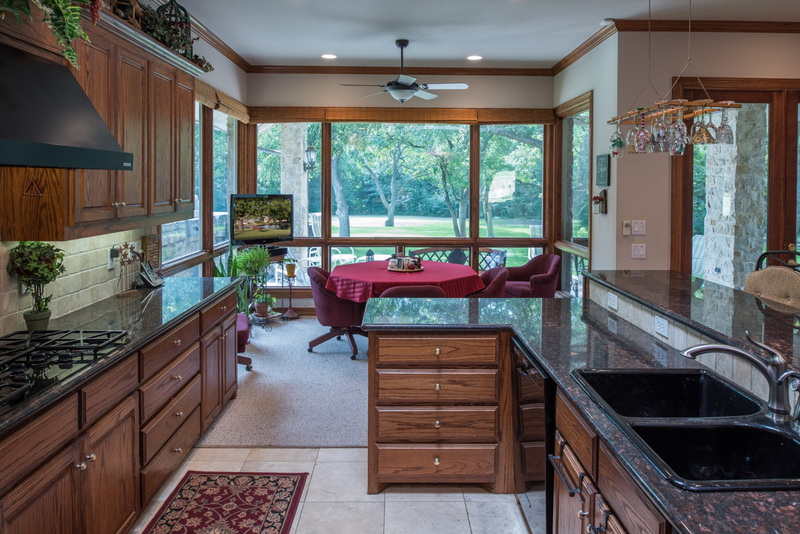 This oversized room also has wet bar access and built-in entertainment and glass cabinetry. 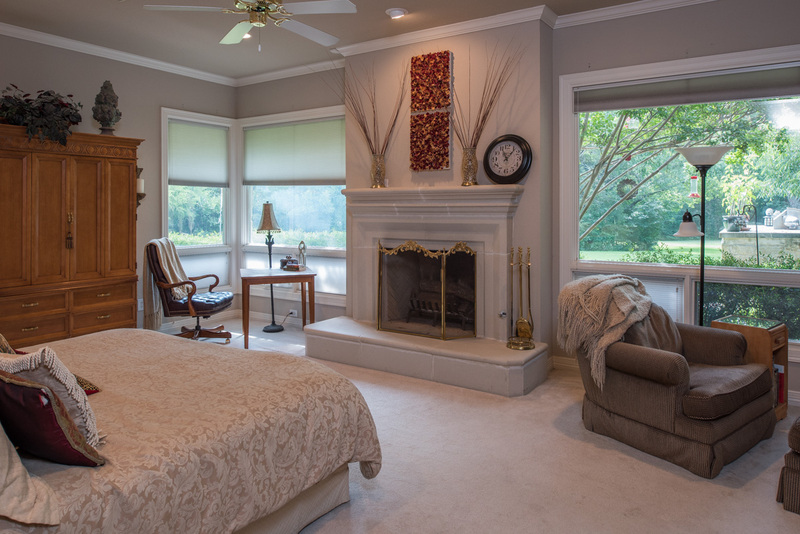 A Half Bath is tucked away off a small hall near the Great Room and the Game Room. 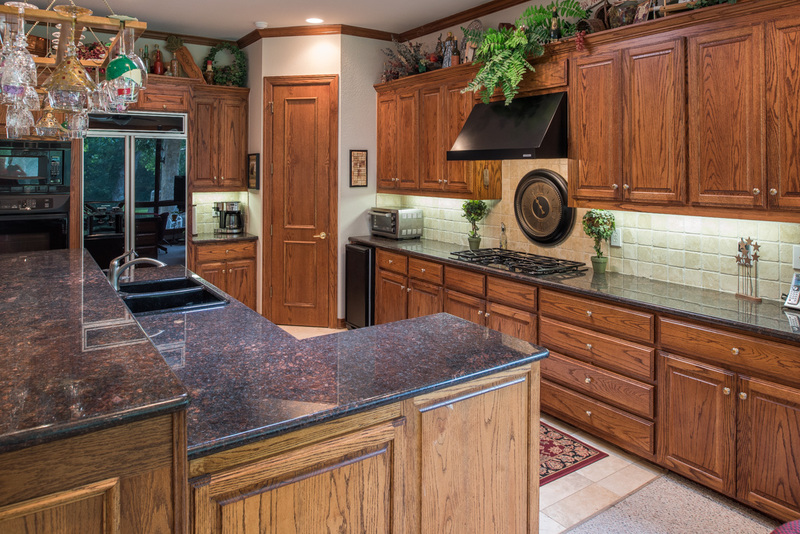 The spacious Kitchen has premium stained cabinetry, stunning granite counter tops, and tumbled tile backsplash, along with a premium appliance package including a gas cooktop. 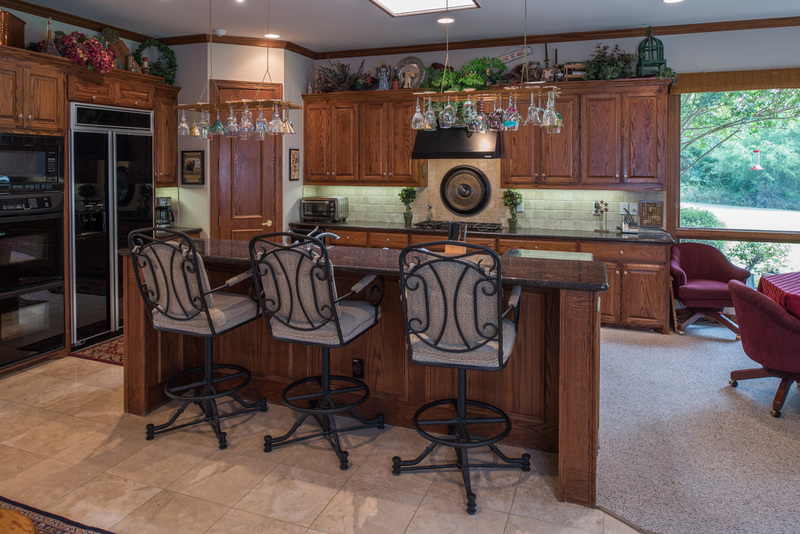 The large center island features storage and seating. 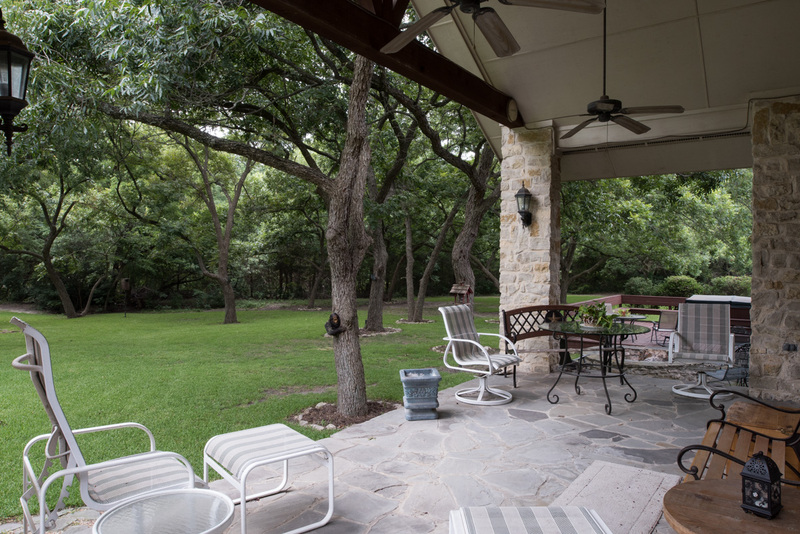 The charming Breakfast Nook is outlined with cased windows and offers access to the Outdoor Kitchen and Patio. 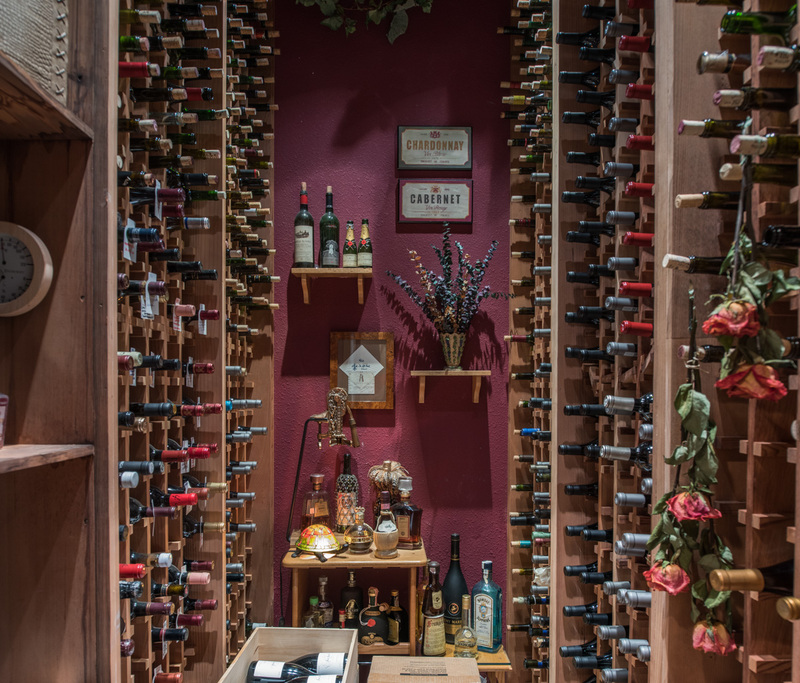 A climate controlled, floor-to-ceiling, 864-plus bottle capacity Wine Cellar is convenient to the Formal Dining Room, Kitchen, and Great Room. 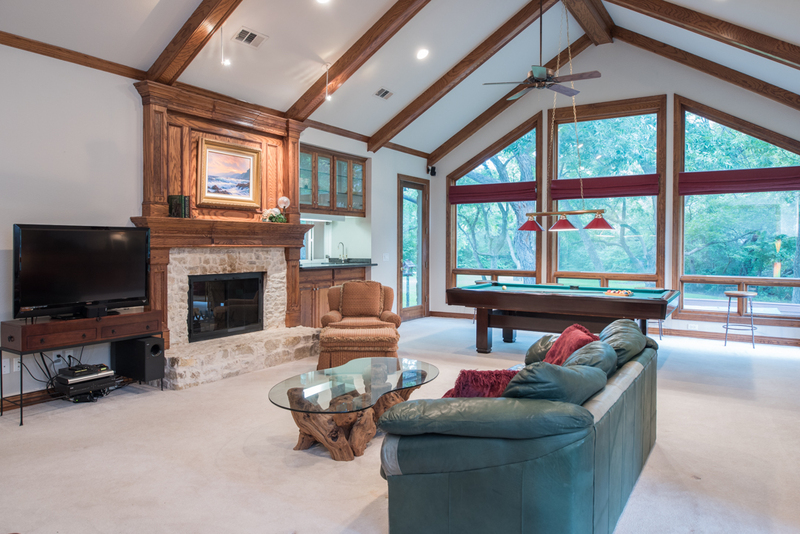 The Game Room is located off the Great Room past double doors and features gleaming hardwood and neutral carpet floors, a stone fireplace with gorgeous mantelpiece with coordinating stained millwork trim and details, and beamed cathedral ceiling. 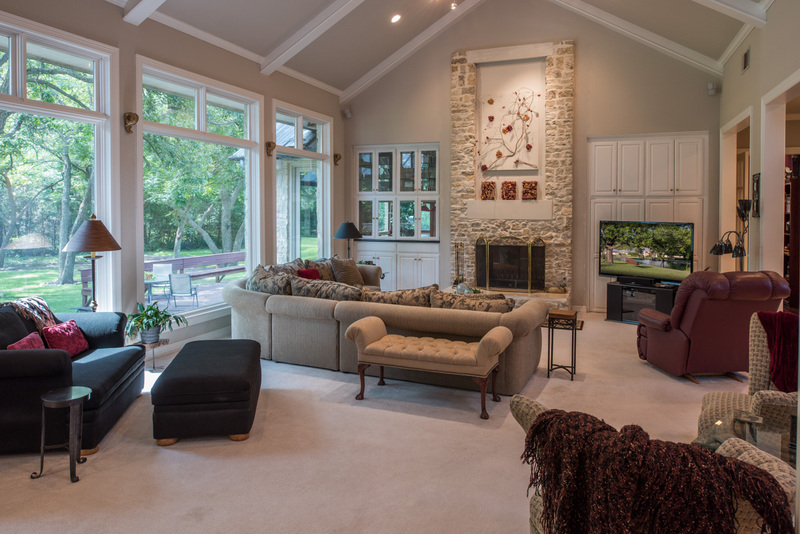 A floor-to-ceiling wall of double-paned windows offer stunning views of the wooded rear property. 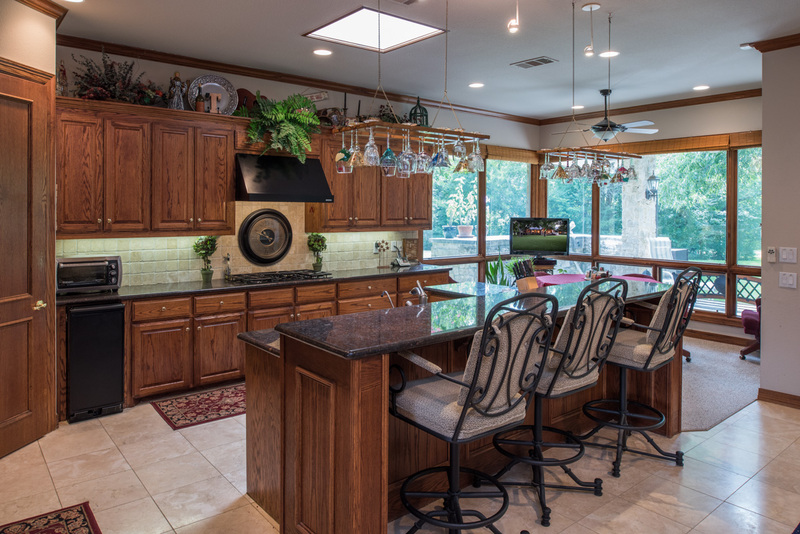 The oversized room was designed for entertaining – with maximum seating area and optimal space for the billiards table, along with a wet bar, and entertainment cabinetry. 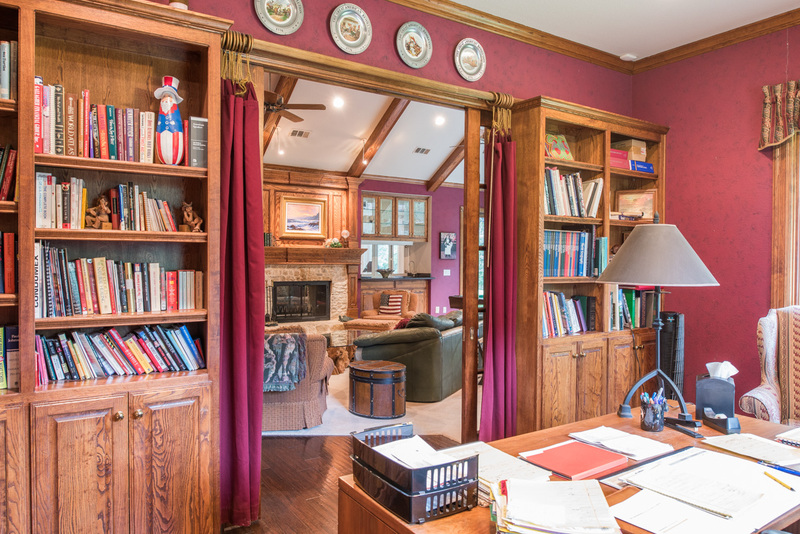 The well-planned optional Bedroom / Study offers double French pocket doors, hardwood floors and trim with built-in credenza and numerous bookcases and cabinetry – with several windows overlooking the property’s beautiful scenery. 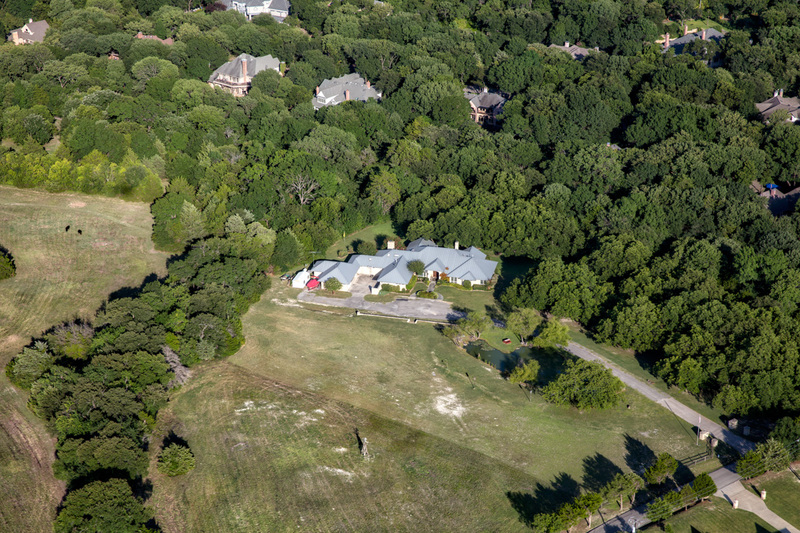 The secluded Master Retreat features neutral carpet, millwork trim, built-in entertainment cabinet, and a cozy fireplace. 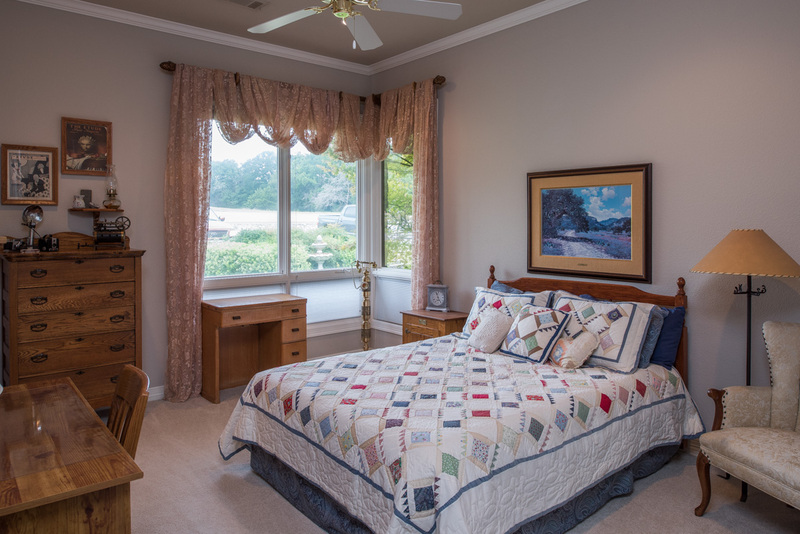 As with all rooms in the home the master has large windows with beautiful views. 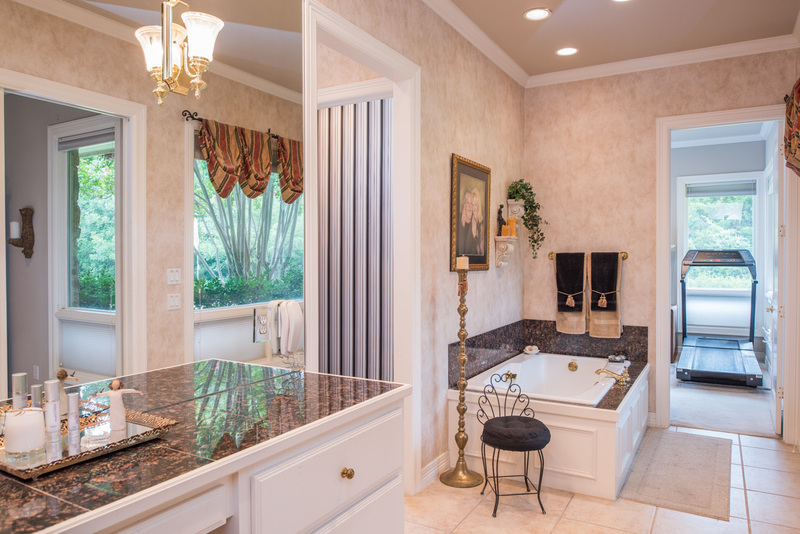 The stunning en suite Master Bathrooms feature his and hers separate vanity/dressing areas with 36” tall granite surfaced vanities and abundant storage, along with separate water closets. 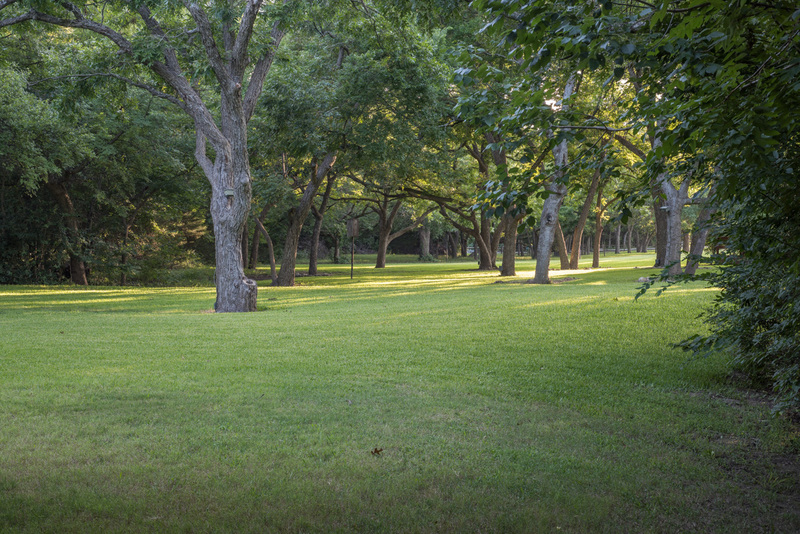 The dual entry two-person shower connects these areas. 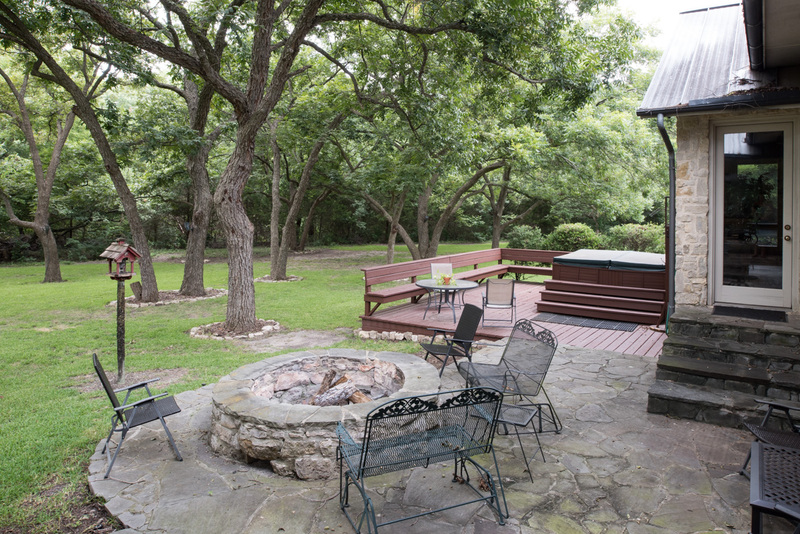 The ladies’ vanity area also boasts a large tub positioned under picture window that is screened by a large exterior flowerbed – a perfect place to relax and enjoy the view. 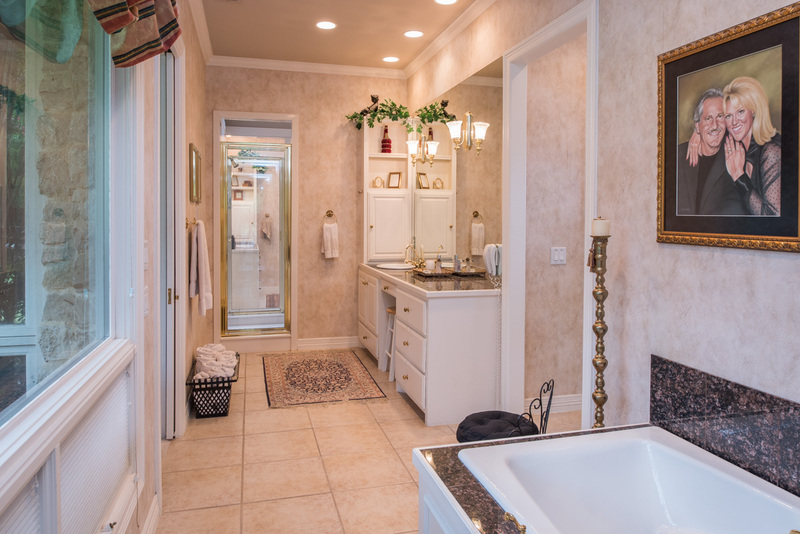 The huge walk-in closet adjoins each vanity area and features custom wardrobe storage and a laundry chute into the Utility Room. 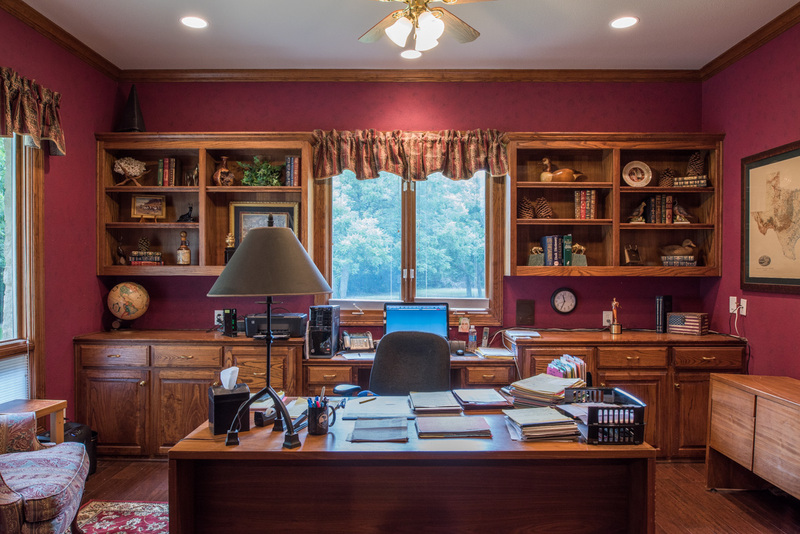 An additional room is placed off the ladies’ vanity and offers a walk-in closet, large windows, and exterior door – easily used as a Bedroom, Nursery, Exercise Room, or additional Office. 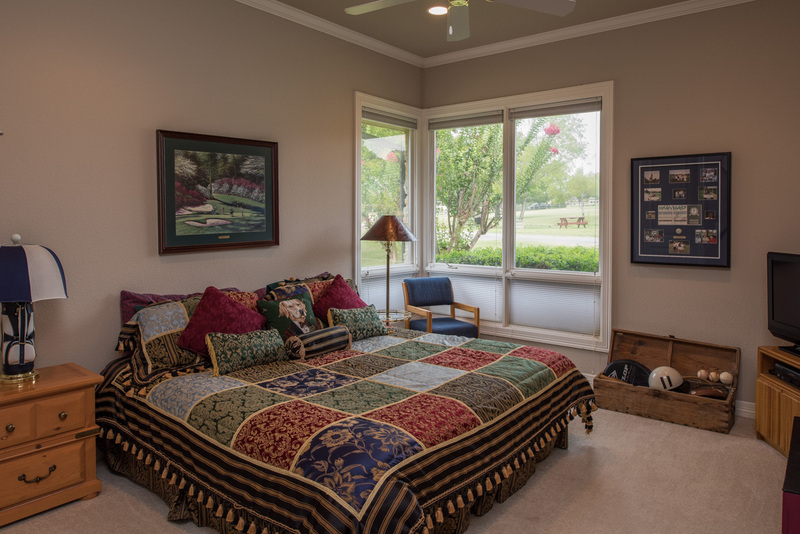 The additional Bedrooms are placed off the Game Room area with a small foyer connecting each. 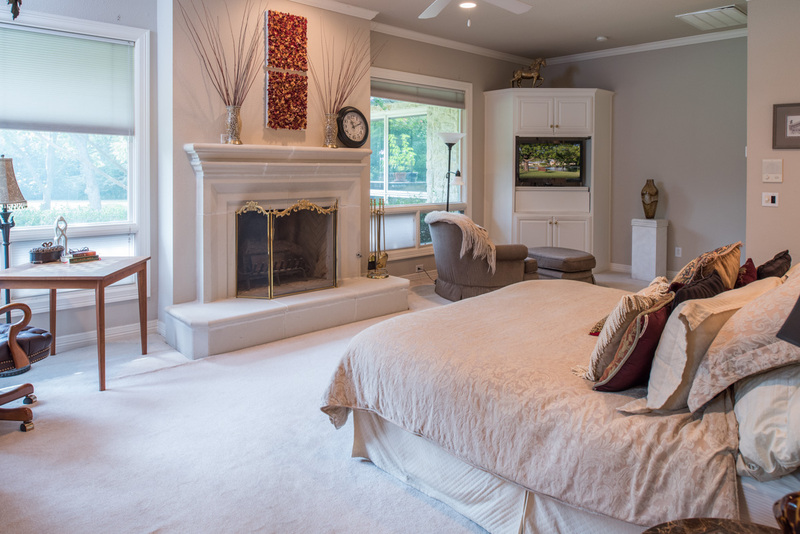 The bedrooms offer neutral carpet, cased windows for views and natural light, oversized walk-in closets, and each has a private full bathroom. 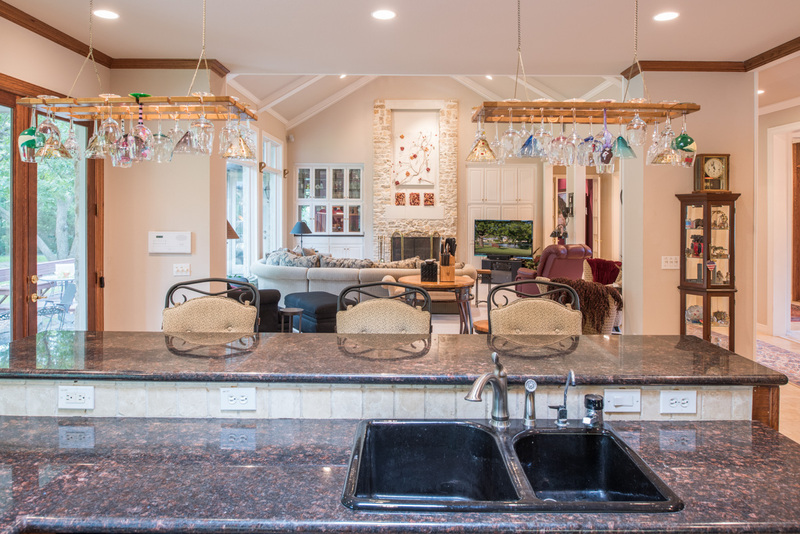 This family home also offers a convenient Utility Room featuring built-in storage cabinets, sink, and hanging drip-dry alcove with laundry chute. 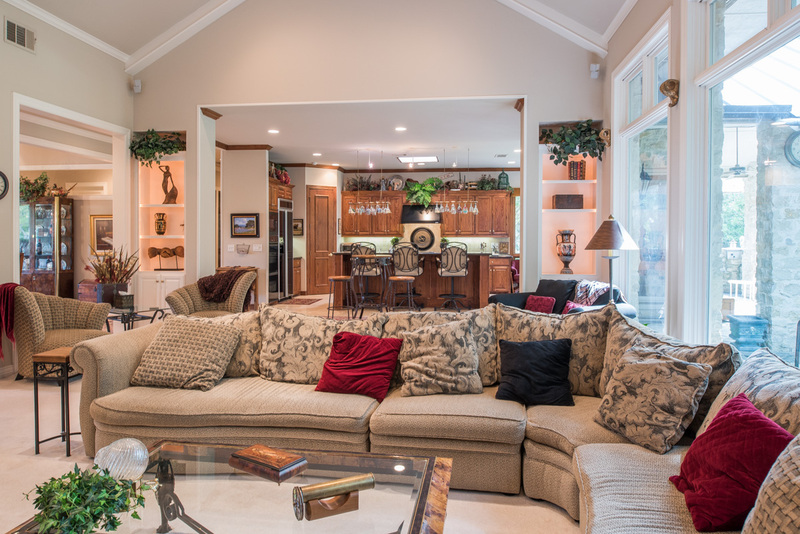 The 2 Car Garage has generous attic access and is located next to the Utility Room. 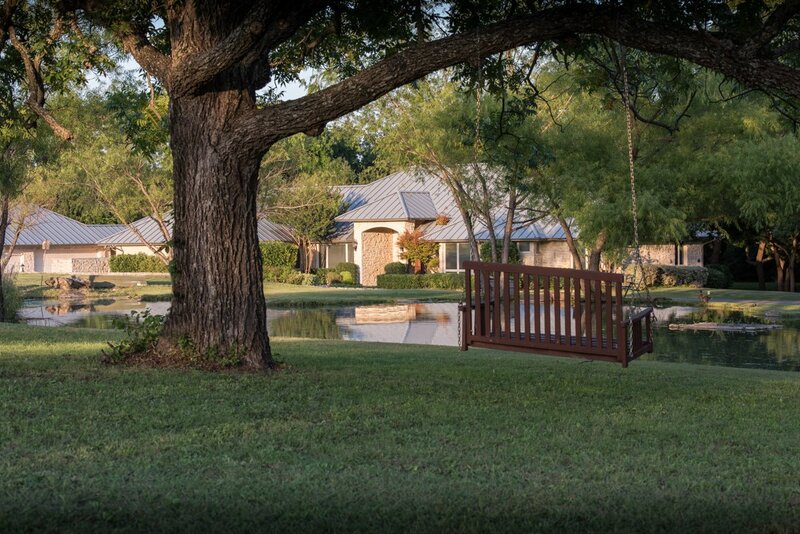 The Detached 3 Car Garage is positioned opposite the 2 Car and features six large built-in storage cabinets plus attic access and an additional lawn equipment garage with separate garage door which can easily be converted to a guest house or in-law suite. 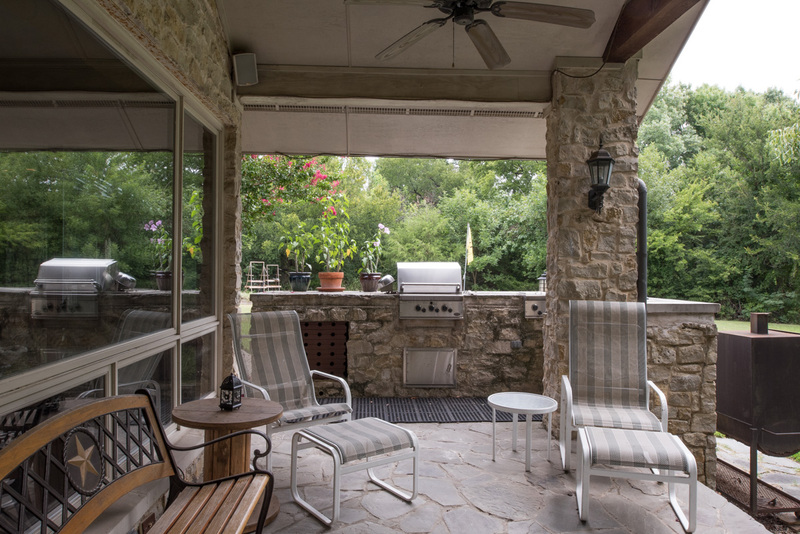 The vaulted 450 sq ft Patio features two ceiling fans, a large Outdoor Kitchen with a stone gas grill station, sink, and extra gas burner. 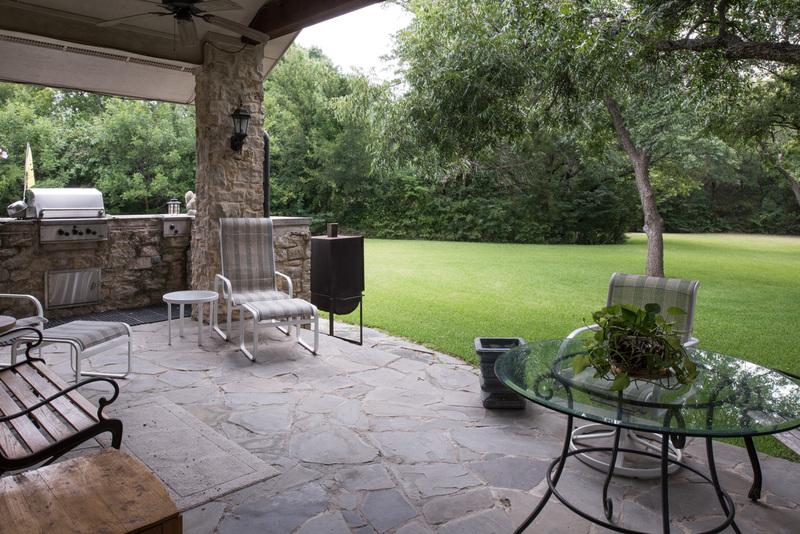 Patio steps connect to the spacious open patio featuring the stone gas firepit. 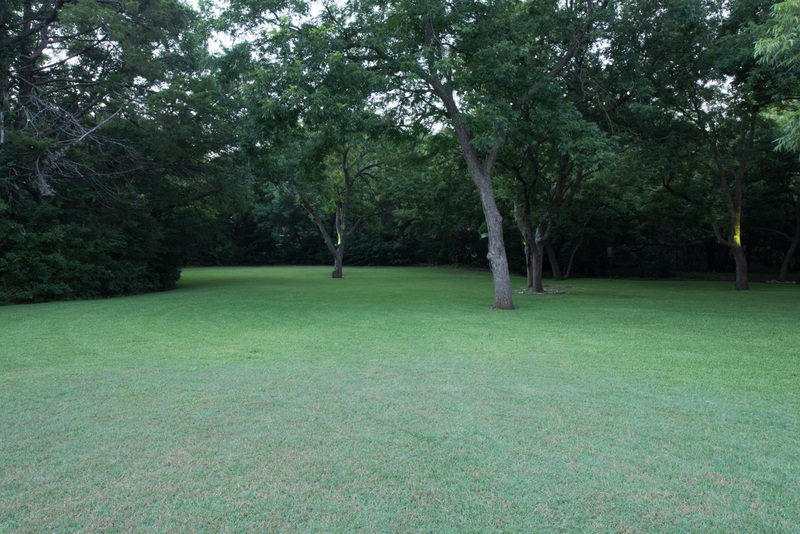 A 400 sq.ft. 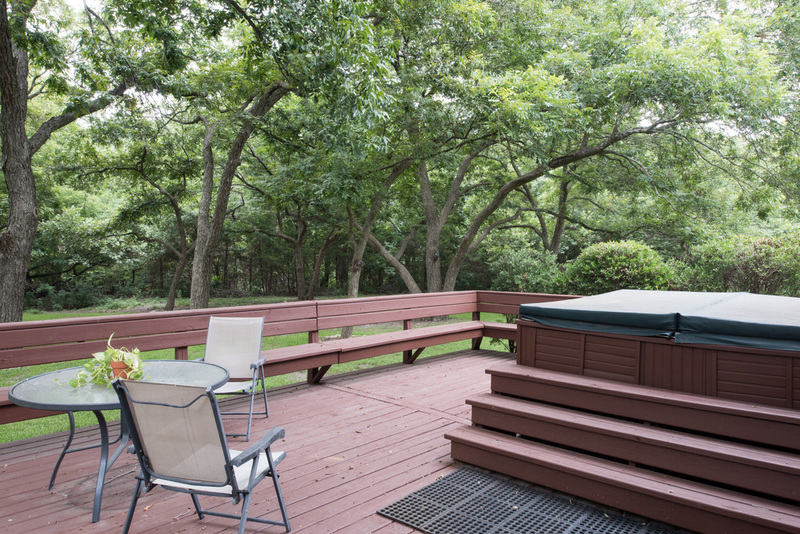 wooden stained deck with built-in bench seats surrounding the 500- gallon hot tub completes this entertainment area. 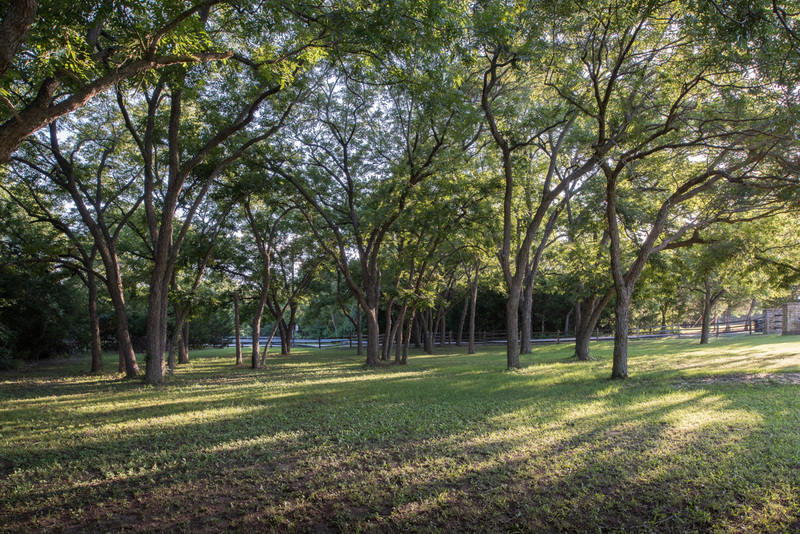 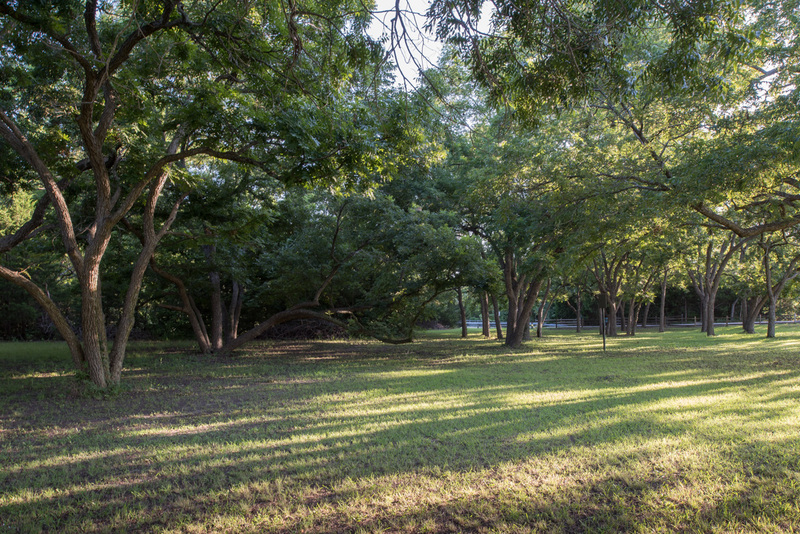 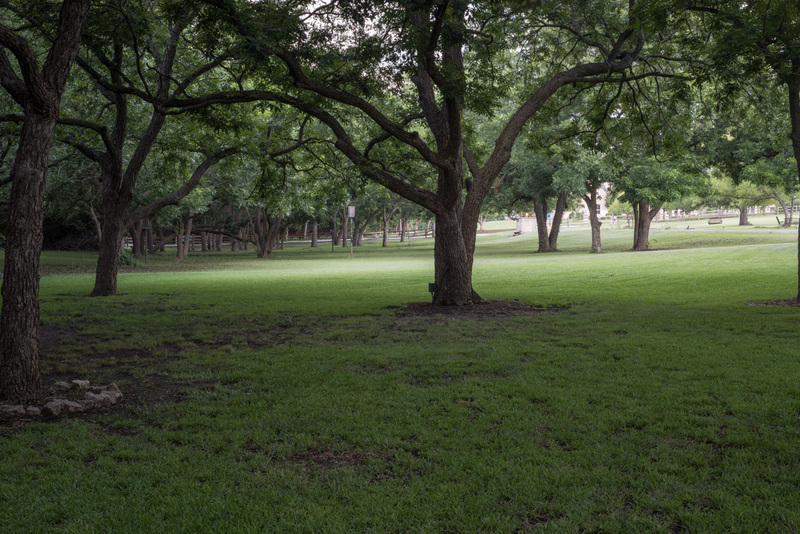 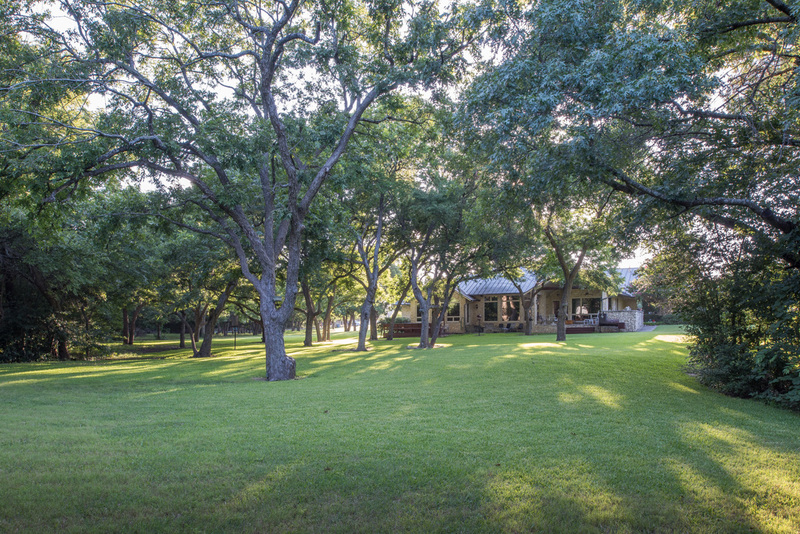 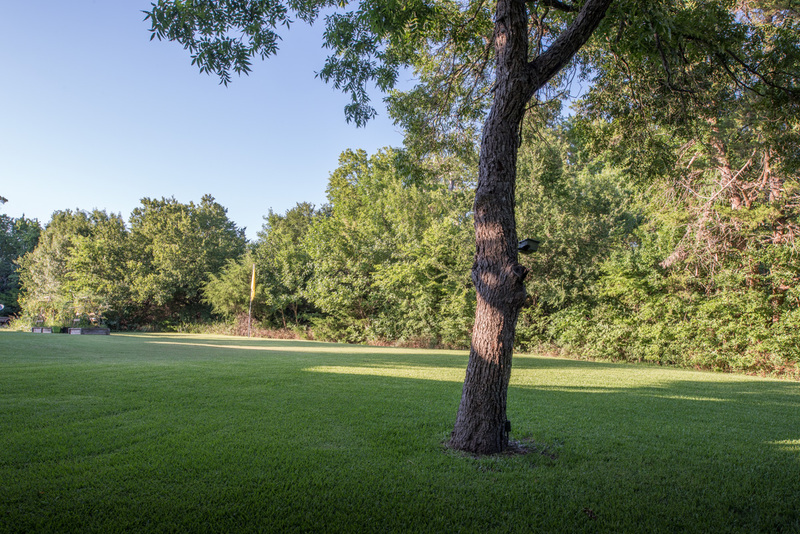 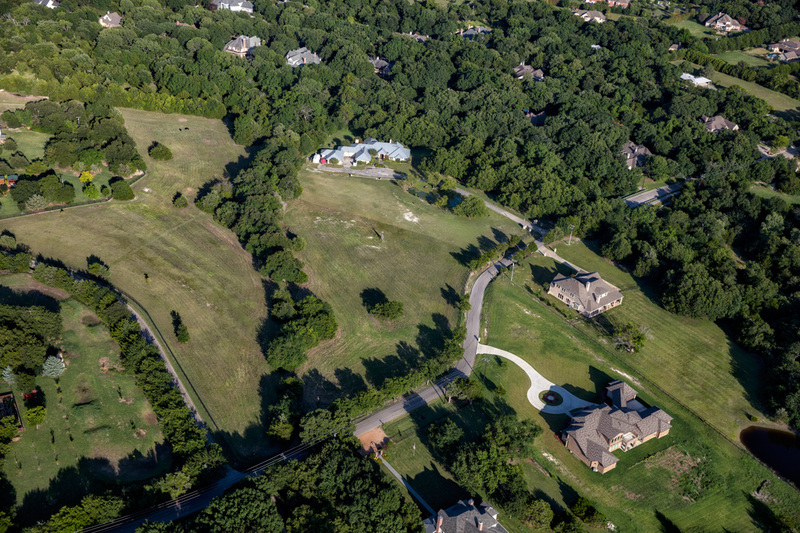 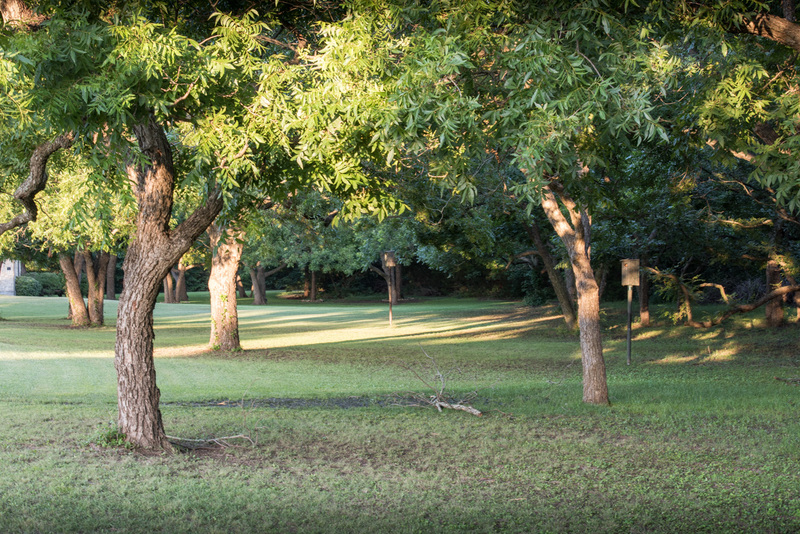 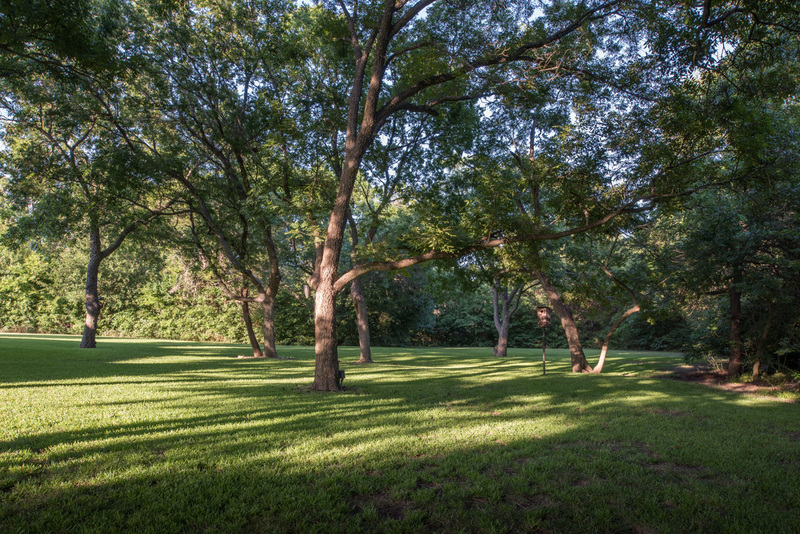 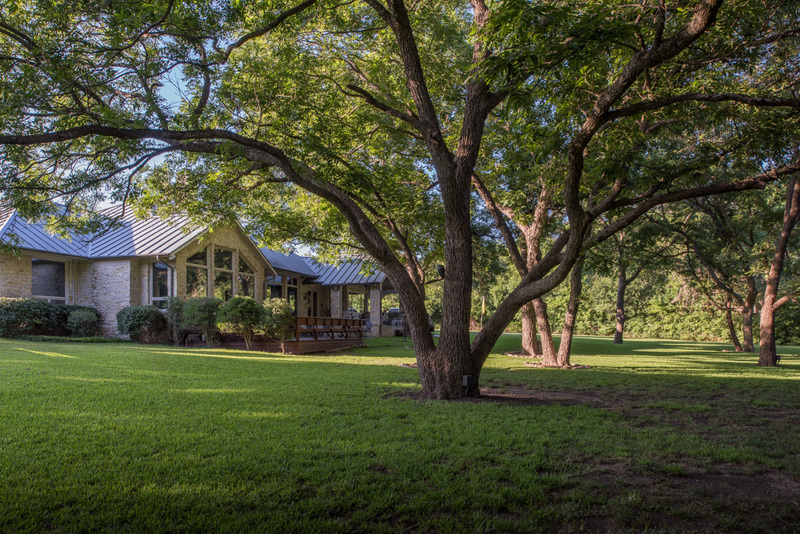 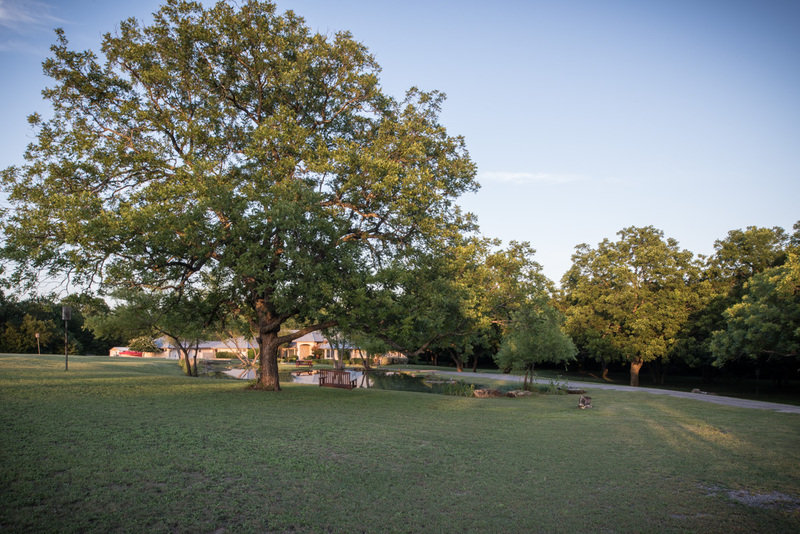 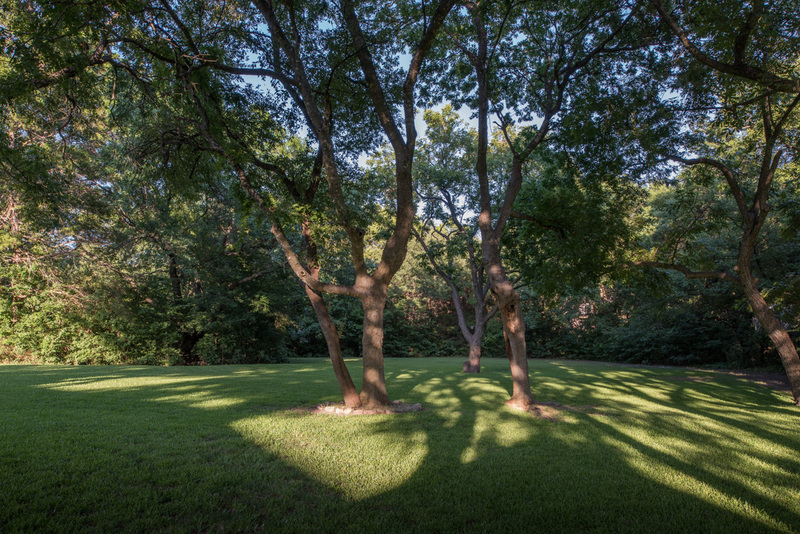 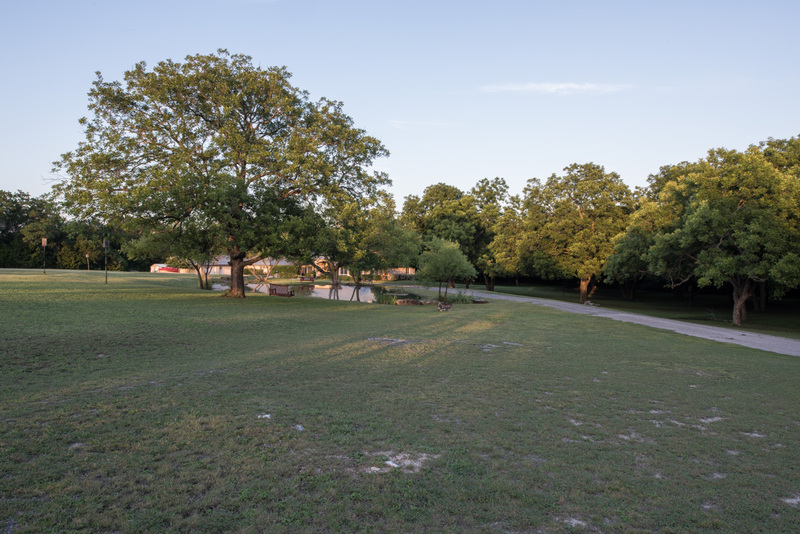 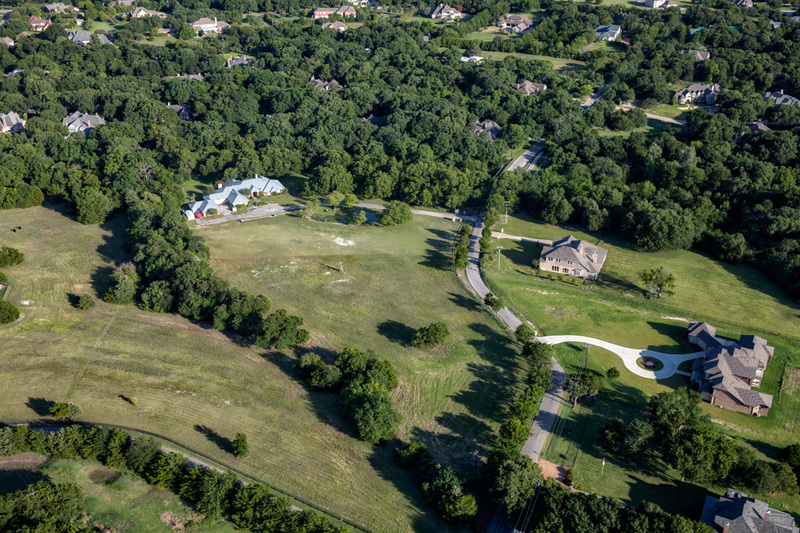 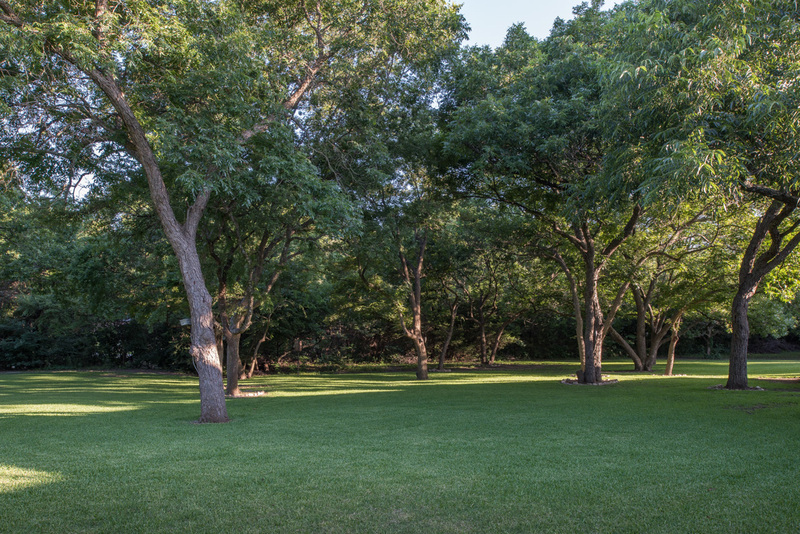 The expansive rear property boasts 45 towering native pecan trees and other native trees with professional uplighting, wide open spaces, garden beds, and a natural tree-line along the creek path. 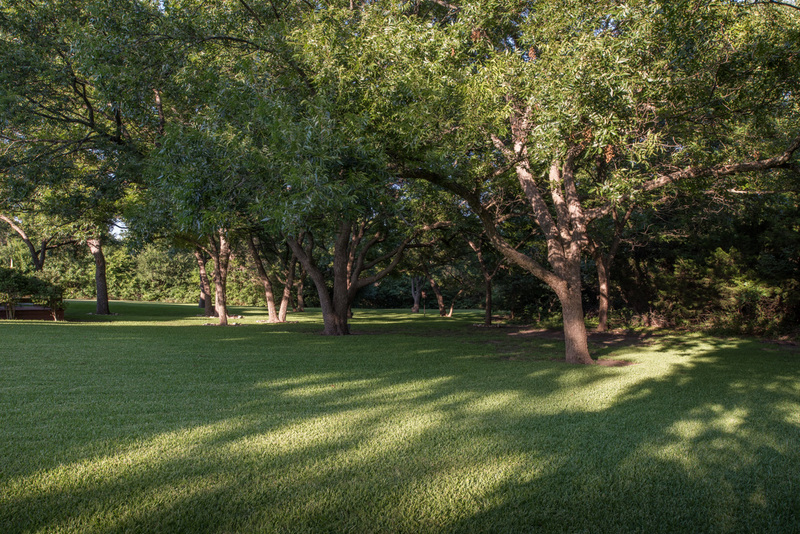 Large professional planted landscape beds surround the residence, overflowing with flowering foliage and shrubs planted and maintained for maximum views. 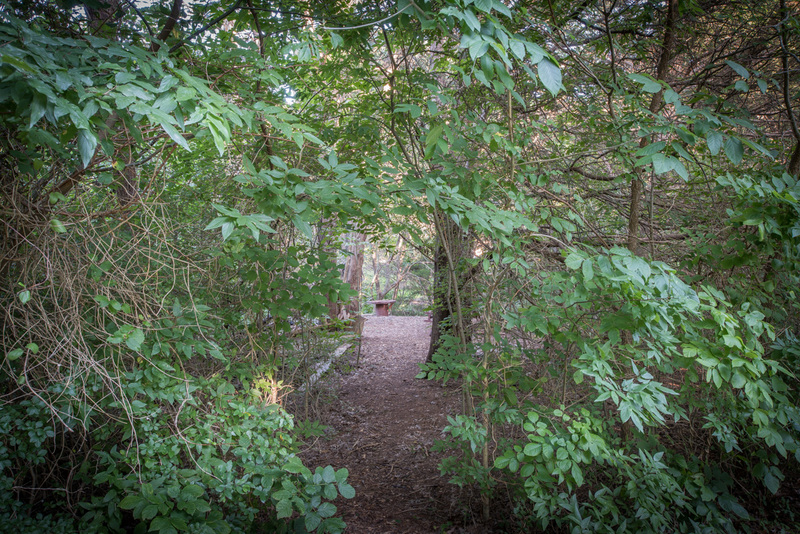 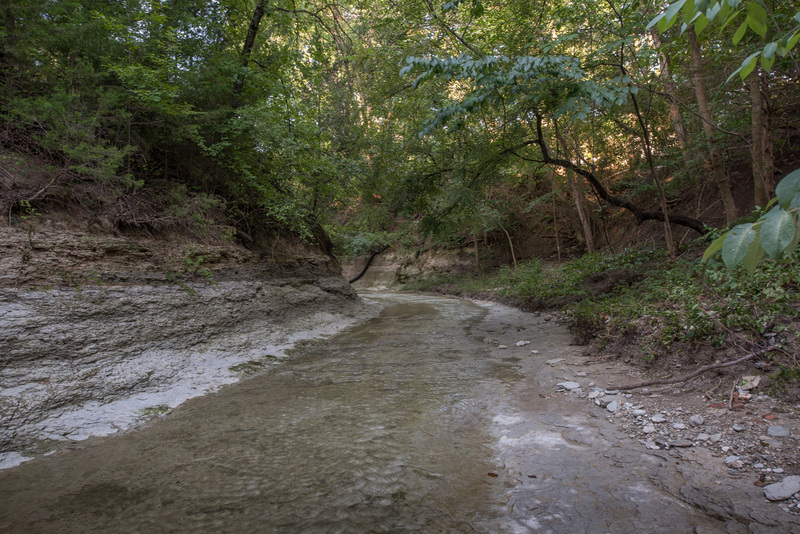 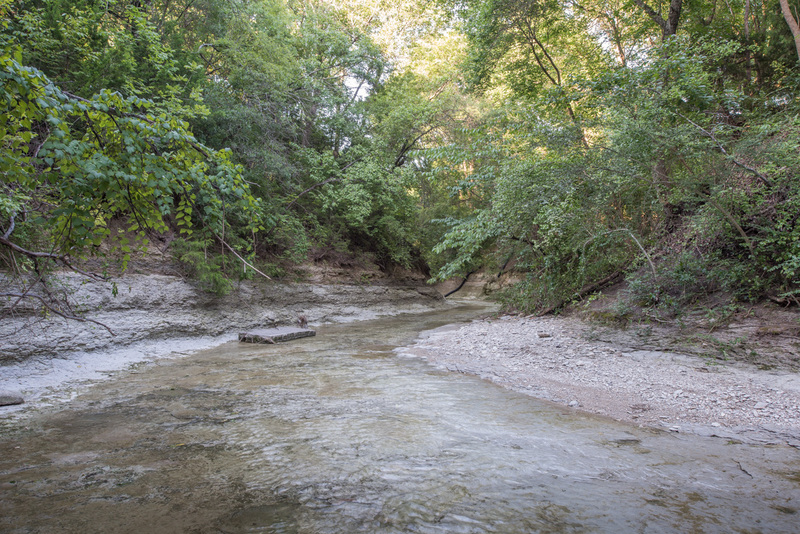 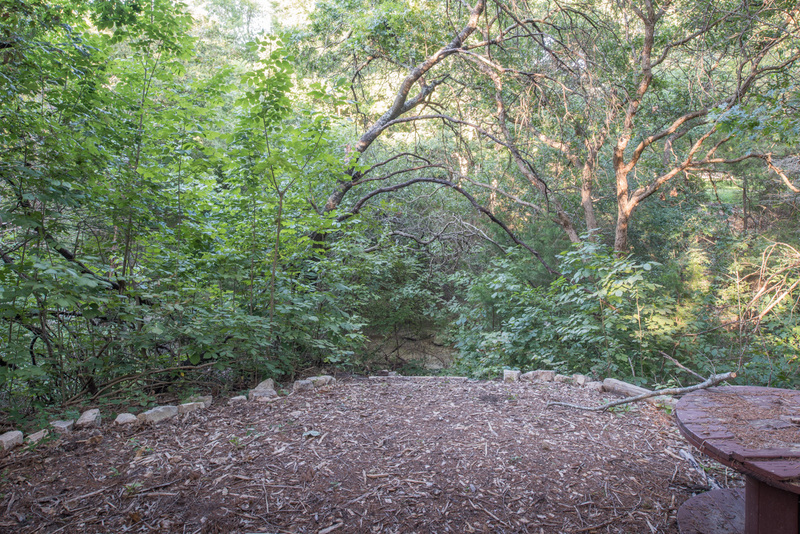 A secluded natural path leads down to this property’s hidden treasure: the tranquil year-round creek under a canopy of trees that features several terraced areas – perfect spots for children’s forts, nature watching, exploring, and relaxing. 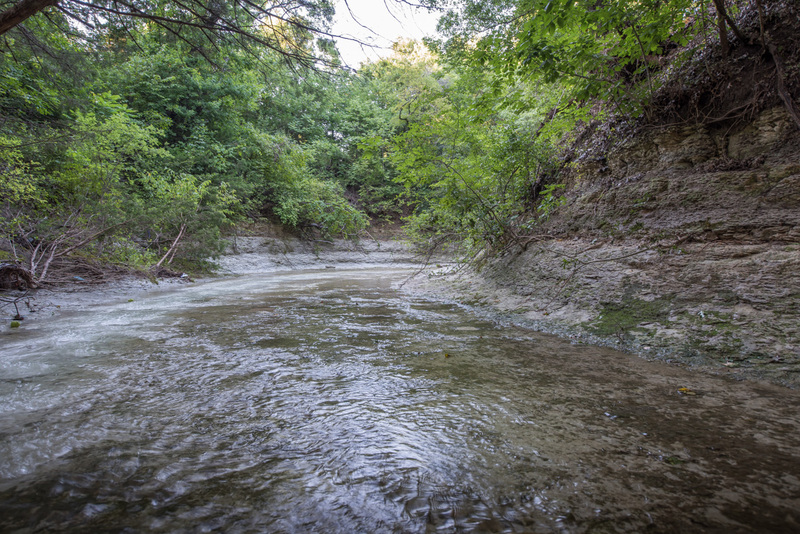 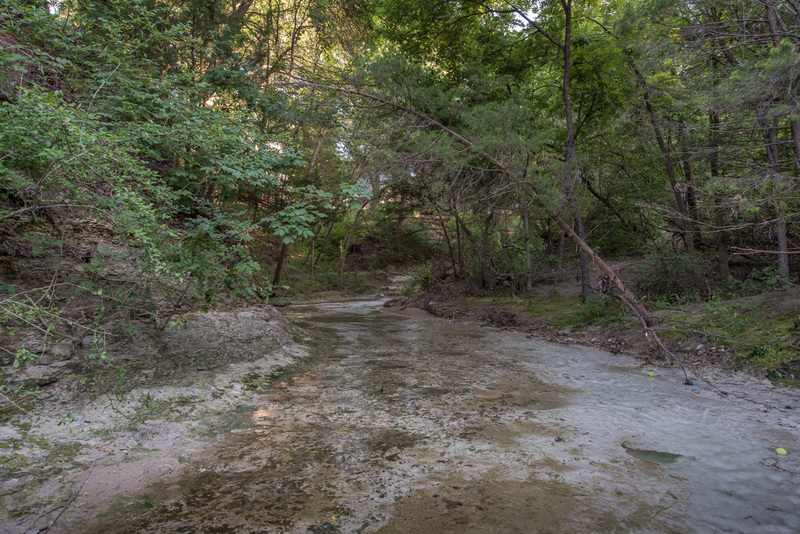 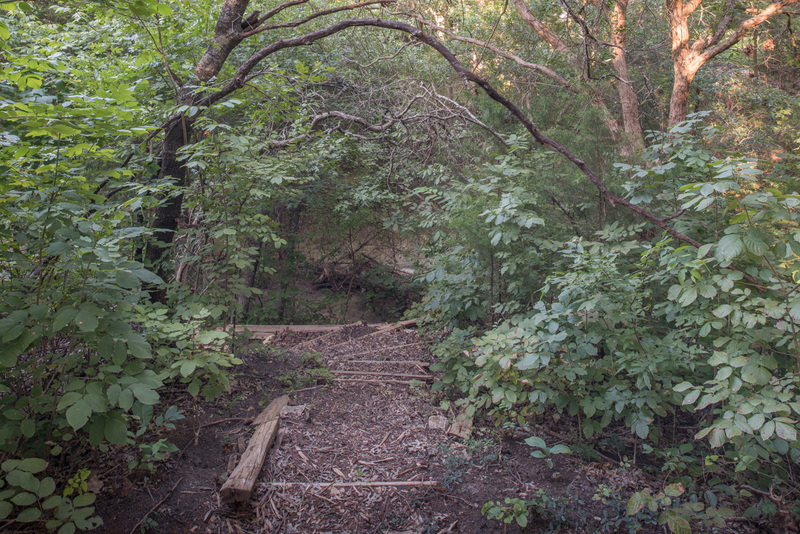 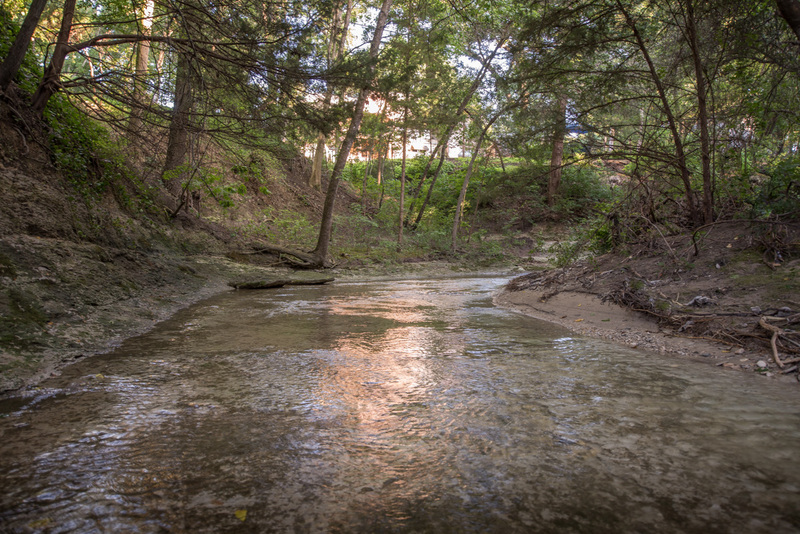 The stepped path leads down to Sloan Creek and is only one of a few properties with creekside access, owning approximately 700 ft. of the creek. 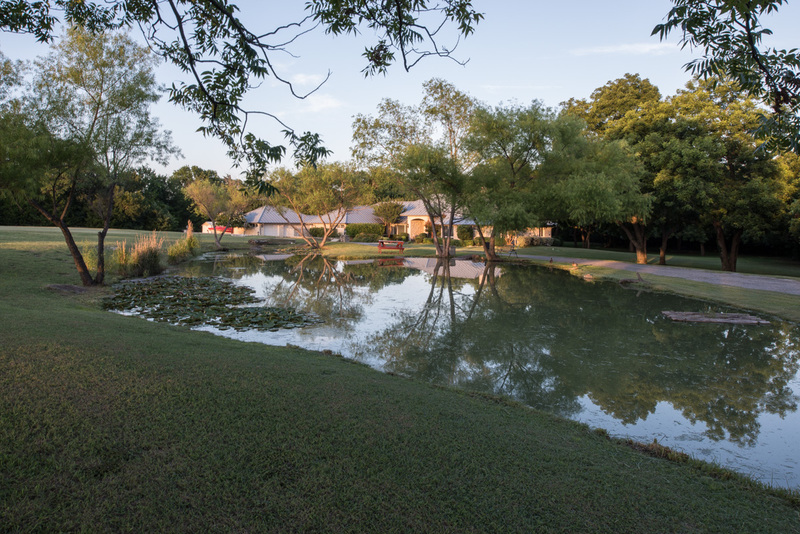 Please note – this unique countryside property has six no maintenance wood-duck nesting boxes, along with countless native birds and animals that frequent the property year-round. 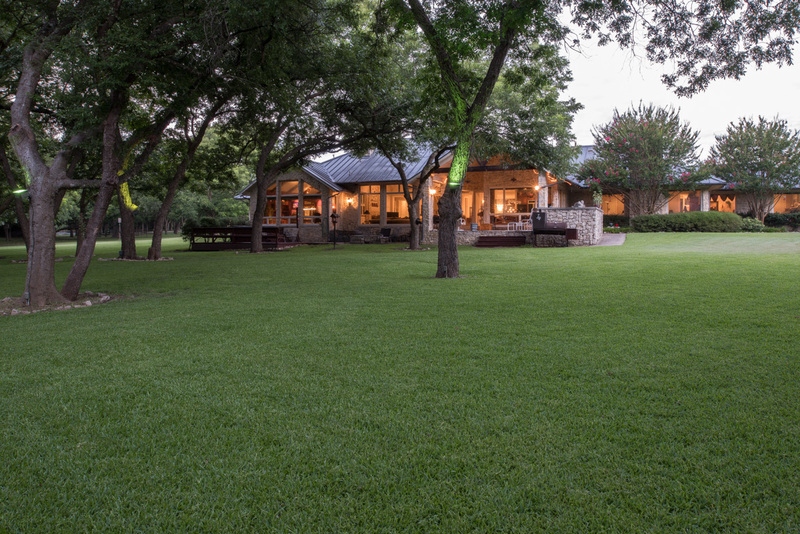 Standing Seam Metal Roof, Full home indoor/outdoor Audio/ Entertainment system, Central Vacuum system, Security system, Recirculating Hot water throughout, Two 250-gallon Crystal Falls Spring Water tanks for Kitchen, wet bar, icemaker, and Master vanities, Two Large attic storage spaces, Split rail fence at road and black steel pipe fence along north and east tree line, 45 native Pecan trees throughout property, Tree up-lighting, Sprinkler/Irrigation system to sodded yard, Pond features creek water with 3/4 hp electric pump and aerator with 2 blowers, 220V outlet at stone front wall for RV hookup, 10 X 20 Morgan shed.